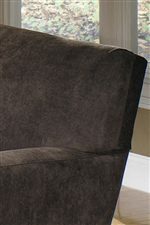 The 786400 series will help you create a comfortable contemporary look in your living room. The collection includes a sofa, chair, ottoman (not shown), and love seat (not shown). 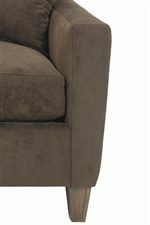 Pieces feature tight attached back cushions and sleek track arms that create smooth clean lines. Deep box seat cushions make the pieces comfortable. Tapered wood legs finish the look. These pieces are available in multiple fabrics by special order, so you can find the perfect match for your home. Browse other items in the 7864 collection from AHFA in the area.